Newschool Builders is a custom residential building company dedicated to providing sustainable, high quality construction services. Innovative design, local and regional knowledge, active project management, and time-honored building practices gives us a reputation that upholds our name. The blend of old school fundamentals and newschool vision is alive in all of our work. Blake started swinging a hammer at the age of 16 for a friend’s father while in high school. Mastering this trade has been his singleness of purpose ever since. 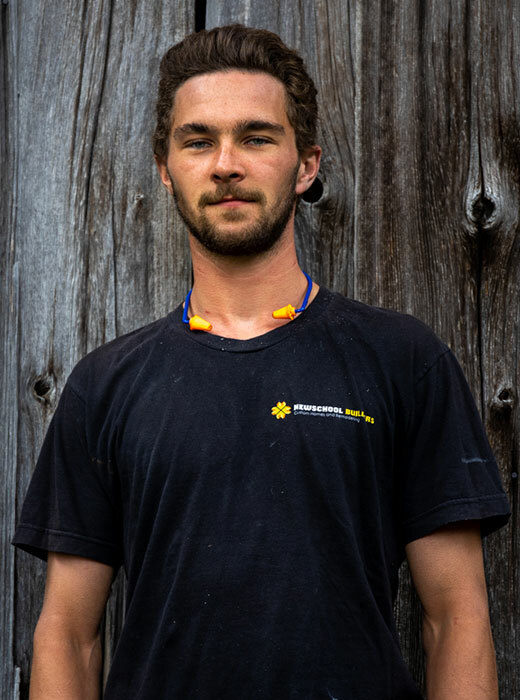 Blake graduated high school early and immersed himself fully in Vermont’s residential construction industry. In the early 2000’s, Blake capitalized on professional opportunities in Western Massachusetts. In addition to refining his craft, while in Massachusetts he also passed the challenging Construction Supervisor’s Exam and secured his unrestricted building license at the age of 22. He remains one of the youngest builders to achieve this certification in Massachusetts. 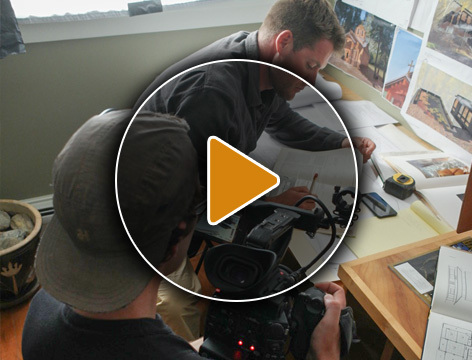 In keeping with the theme of continued development, Blake returned to Vermont for a project management opportunity with a large spec home contracting company. The experience gained in those years, and the mounting passion for quality workmanship, motivated Blake to return to his roots in the highly demanding and rewarding field of custom home building and remodeling. Newschool Builders was born. Blake has played an active roll from the beginning of Newschool Builders. It’s not uncommon to see him on site working through an issue with an architect or subcontractor, or mentoring a member of his highly skilled team. Blake is deeply engaged in each project, from beginning to completion, which insures the client’s experience and his team’s workmanship holds true to his rigorous standards. Blake spends most of his free time outdoors. He has chased fish with a fly rod extensively in the US as well as internationally. In the fall you can usually find him in a tree stand, tucked away in a remote part of the New England whitetail woods, or chasing elk across Montana’s vast wilderness. In the snowy winter months, Blake has been known to declare the occasional company powder day. Nate’s background is in engineering with a concentration on process development and data driven decision making. Before work with Newschool Builders, he managed large manufacturing facility build outs and new commercial construction projects. Blake and Nate have worked closely together for years in the active development of the Newschool Builders organization. Many of the processes and systems we employ today are a result of Blake and Nate’s work together. This dedication to process improvement has resulted in our organization’s industry leading client experience and tightly managed project execution. When not working with our organization, Nate is either training with his military unit or riding his horse. Pat Has been in the building trades since 2003 and had the privilege of working with some of the best craftsmen in the Mad River Valley. His experience in all aspects of fine homebuilding allows for a comprehensive understanding of a wide variety of projects. You’ll see this in his framing as much as his trim work. Pat has become a great leader for our team. Pat was born and raised in the Mad River Valley. After attending Endicott College in Beverly, MA, he moved back to Vermont to start his family. Pat has a more broad base of experience than most carpenters, and brings a well rounded knowledge base to our team. Pat is our go to team member when it comes to complex framing challenges. He is also uniquely capable of handling fringe discipline work such as audio, video, and low voltage lighting systems. In 2001, Pat was ordained as a minister. He has a passion for serving his community and has traveled extensively using his talents to benefit others both domestically and abroad. In his free time Pat can be found playing/writing music with his wife Alison or coaching his children’s sports teams. From an early age, Tanner began appreciating the fruits of hard work. He was raised in a home built by his father and remembers watching the process unfold around him. This experience had a lasting impression on him; a theme that would return in 2012 in the form of a carpentry career with Newschool Builders. After spending several years in Alaska and earning his college degree, Tanner and his fiancé headed back home to the east coast to start their family together. 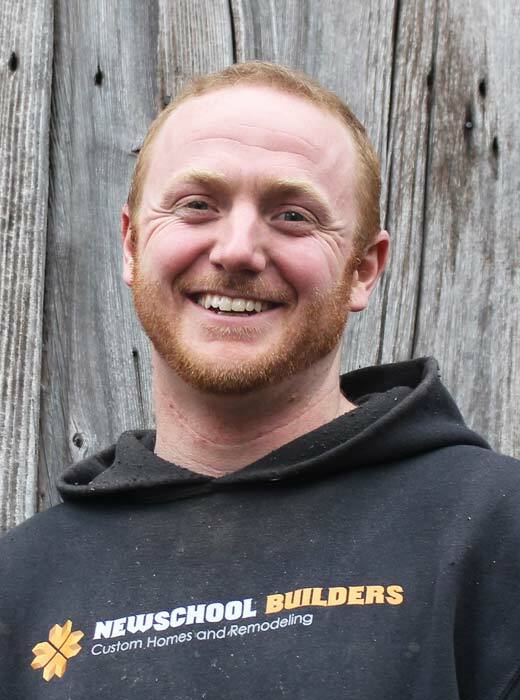 After returning from Alaska, Tanner joined the Newschool Builders team as a carpenter. Growing in knowledge and experience, he decided to GC his own personal timber frame home construction in Moretown, VT. This experience opened a door for Tanner with our company, and since, he has proven himself to be one of our most productive site managers. In his free time, Tanner enjoys the pursuit of fine woodworking in his personal shop. Everett started with Newschool Builders in May of 2014. He has been dedicated to the trades for more than 10 years. In addition to carpentry, Everett has experience as a stone mason specializing in dry lay stone arches. While Everett attended college, he remodeled and restored numerous custom homes in Burlington, VT and Nantucket, MA. Through the years Everett has developed specialty skills in wood strip boat and tree house construction. You will be hard pressed to find a more passionate and effective site manager. Everette treats his jobs as if they were his own home. Over his time in leadership with our company, he has grown to develop strong relationships with all of our internal and extended team members. His passions in life include spending time with his lovely wife Suzanne, farming, fishing, hunting, canoing, snowboarding and hiking with his dogs. 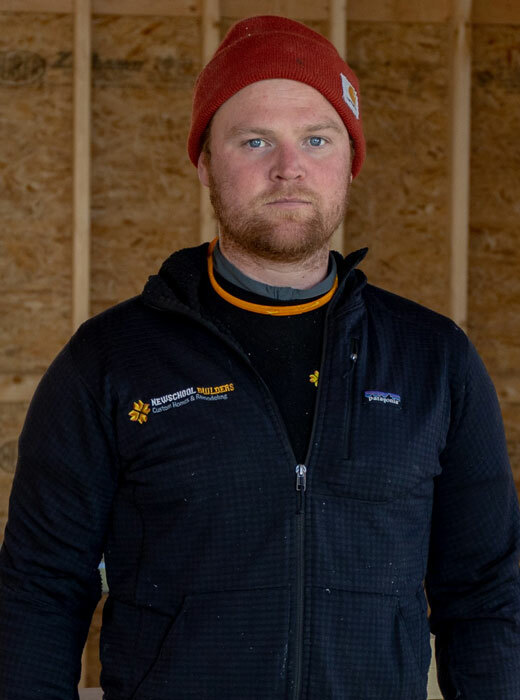 Andrew was born and raised in Chittenden County where he has been immersed in high-end residential remodeling since he was 15, learning the trade from his father during summers and school breaks. 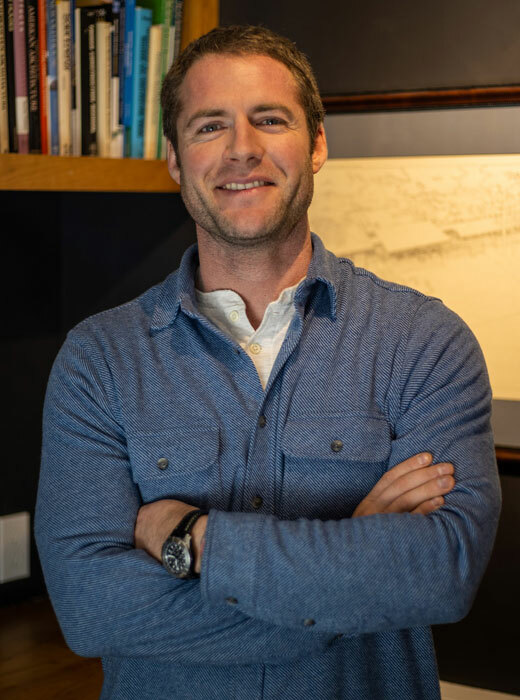 After an education in the Humanities at the University of Vermont, Andrew devoted himself to the trades full-time, including spending a number of years in San Francisco doing construction management and historical preservation work before settling back down in Vermont. 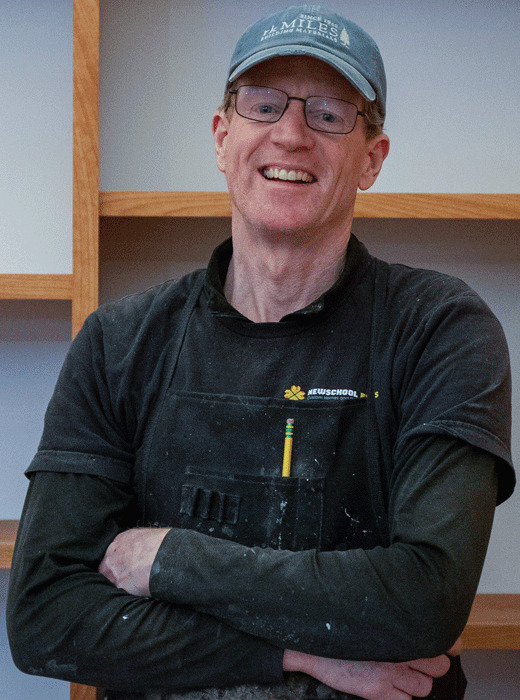 While a remodelers skill set must be wide-ranging Andrew excels as a finish carpenter, where equal demands of quality, efficiency, and professionalism bring out his best work. He thrives working in an atmosphere where more is expected of the building trades and 'high-performance' applies not just to a building's envelope but also to the labor of building it. Newschool Builders was a natural fit. When not at work Andrew can reliably be found mountain biking, snowboarding, or reading literature in translation. Geoff was first introduced to woodworking while in high school. Since that time he has either held a position as a carpenter, or worked in a wood shop. 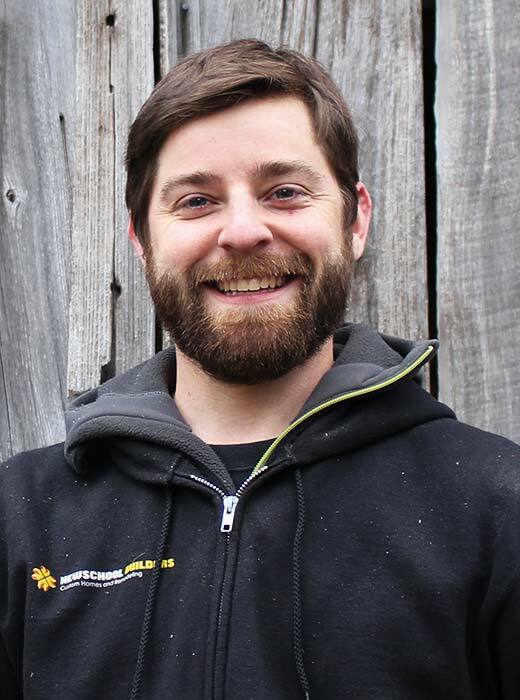 Geoff worked for a prominent custom home builder in the Mad River Valley for well over a decade both working in the field and running a custom millwork shop. 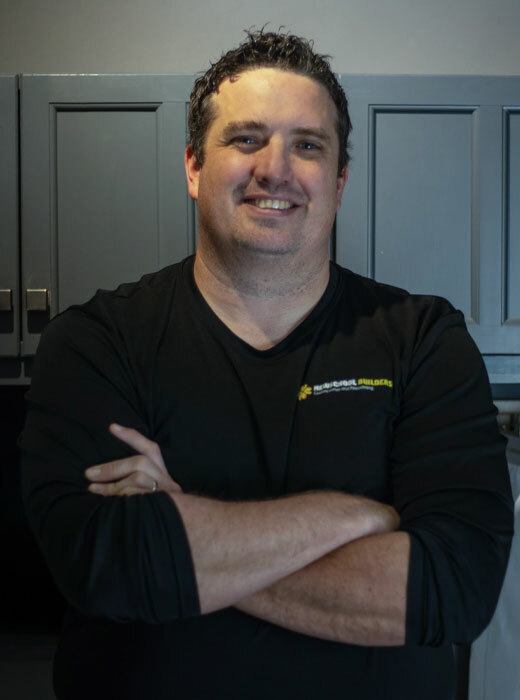 Geoff brings an unparalleled skillset forged through years of experience working on highly detailed projects as a career carpenter and master craftsman. We are very excited to have Geoff working with NSB. Geoff spends most of his time when not working either coaching nordic skiing, mountain biking or ripping turns up at one of our awesome mountains. As a kid born and raised in rural Vermont you have to be creative when it comes to entertainment. From an early age building seemed to be a part of Ian’s life, whether it was building bike jumps, tree forts or helping his father build several boats and a small cabin, working with his hands has been a constant. Throughout the years carpentry has been a way for Ian to support himself both financially and creatively. 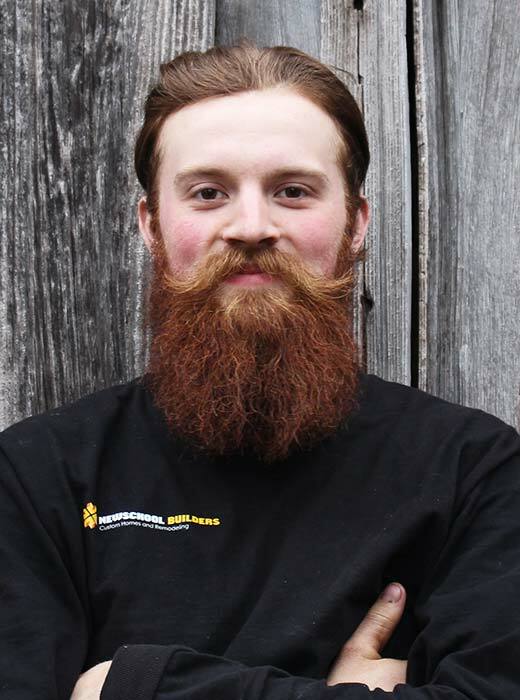 After graduating from Montana State college and traveling throughout much of the states, Ian returned to live in Vermont and take up a full time career in the trades. Apart from work, Ian spends most of his free time in the mountains and waters of Vermont. Growing up with his father as a builder, the trades were impressed on Travis from a young age. He has worked with a variety of high end builders over the years, including his father, and has been a sponge for knowledge along the way. Travis loves working with his team here at NSB and is always looking for opportunities to grow and develop both personally as well as professionally. 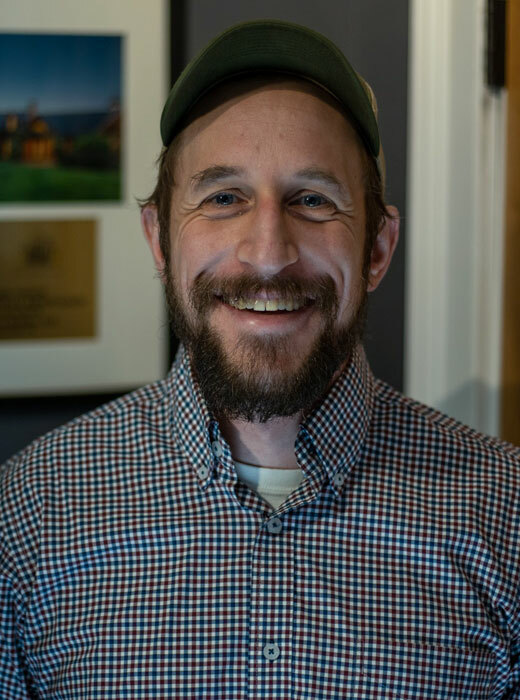 Outside of work, Travis enjoys everything Vermont has to offer including water sports on the lake in the summer time and going for hikes or sledding with his daughter in the winter months. Adam has been in the building industry for over 10 years. His main focus and passion is with timber framing and fine woodworking. 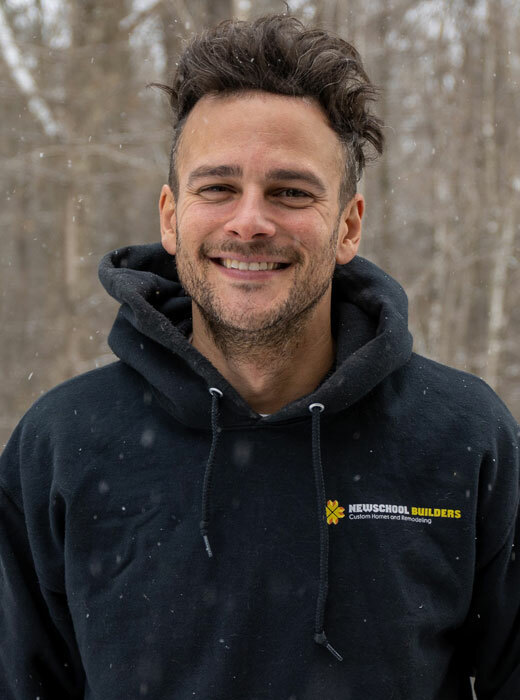 He entered the building field with a bachelors degree in Environmental Science and Education, hoping to make an impact and bring environmental awareness to the construction industry. 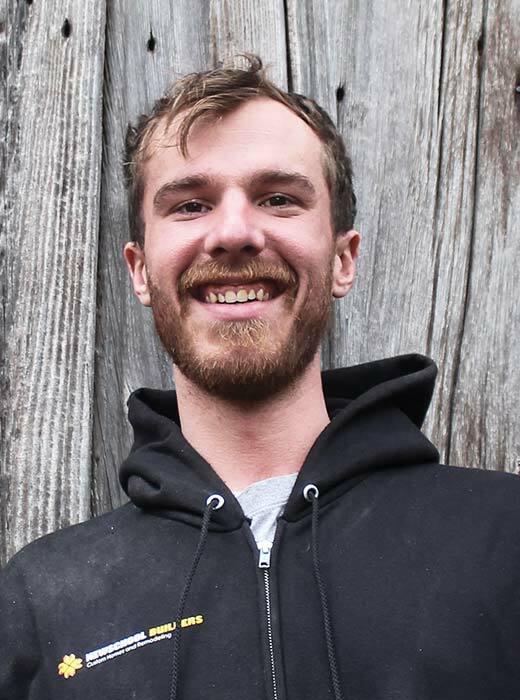 Since joining our team, Adam has demonstrated his value as a disciplined and detail oriented carpenter. 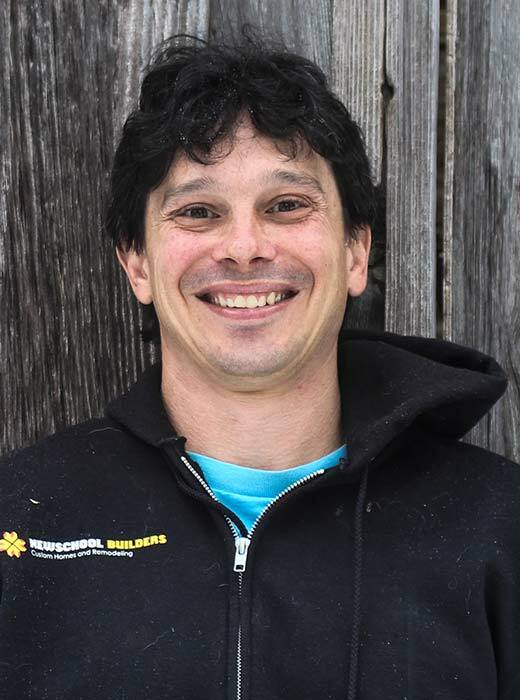 When not working at Newschool Builders, he is usually either working on his own house or spending time with his two boys and wife hiking, skiing or climbing. Calvin brings a versatile skill set to the table. In addition to being a skilled carpenter, Calvin is an experienced diesel mechanic and welder. His work ethic is unparalleled, and he is always excited to learn something new. When not at work, Calvin can be found working on leather, guiding snowmobile tours, fishing on the reservoir or riding his motorcycle. 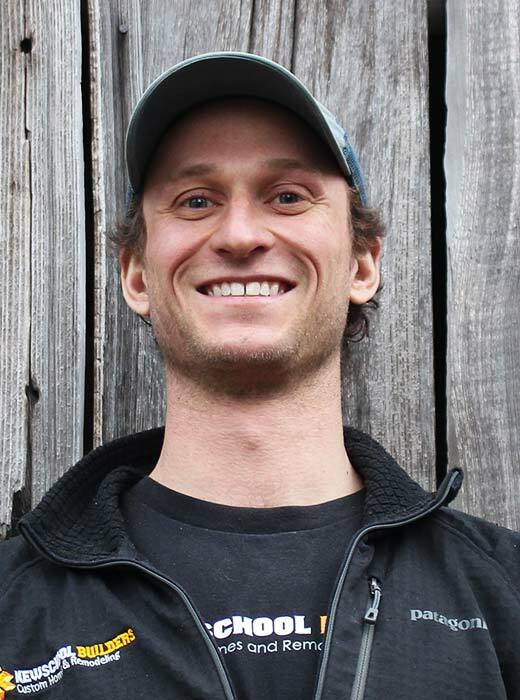 Gordon was raised in Bristol, Vermont and has worked in the construction industry since he graduated high school. He has enjoyed woodworking since childhood. Gordon’s vocational passion lies in building high performance fine homes where he can combine his talents as a carpenter with his desire for a sustainable future. He appreciates the importance of good design, and enjoys working hard to make that design a reality. During his leisure time Gordon enjoys woodworking in his shop, hiking, canoing, biking, music and spending time with his better half Adriana. Tom grew up in the central Vermont, where working hard was a way of life. From an early age he would work with his father during summer vacations, who at the time was a Foreman for a high end residential construction company out of Woodstock Vermont. Tom started off pushing a broom and cleaning at age 10. He observed carpenters and got a feel of how a jobsite operated. Tom progressively starting doing more the longer he stuck around. After finishing high school, Tom went to work for a commercial construction company where he gained a lot of valuable skills and was exposed to varying construction methods. Aside from work, Tom loves to be outdoors, fishing, hiking, rocking climbing and of course, riding his dirtbike.